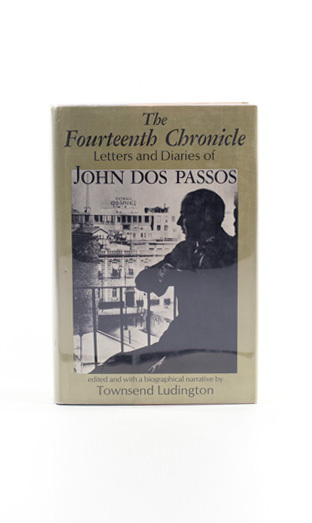 The collected letters and diaries, collected and edited by American studies scholar Townsend Ludington, reveal the depth of Dos Passos’s friendships, his interests, and his explorations abroad. They provide snapshots of major 20th century books-in-progress, as ideas undergo revision and peer criticism. They convey the author’s ideological journey over the course of the century. Several common threads exist throughout the correspondence—the search for a form of government that respects human dignity, the search for a literary form relevant to modern concerns, and the difficulty of making a living as a writer. The letters and diaries document travels across Europe, South America, Africa, and North and Central America. The collection includes letters to a large constellation of friends: Ernest Hemingway, Rumsey Marvin, Dudley Poore, Robert Hillyer, John Howard Lawson, Horsley Gantt, Stewart Mitchell, E.E. Cummings, Edmund Wilson, Malcolm Cowley, Upton Sinclair, and Gerald and Sara Murphy.